The episode of arthritis that started with pain in my neck two weeks ago and spread to involve my left knee a week ago, is now responding well to treatment with non-steroidal anti-inflammatory drugs. At present flexing my knee beyond 90 degrees it is still a little painful. However, on account of the substantial improvement, today I went for an easy 5Km run in the low aerobic zone. During the run I was not aware of any substantial pain and 6 hours later there is no sign of significant discomfort. So I think the worst of the episode of arthritis is now behind me though I need to avoid over-doing things for at least one more week. 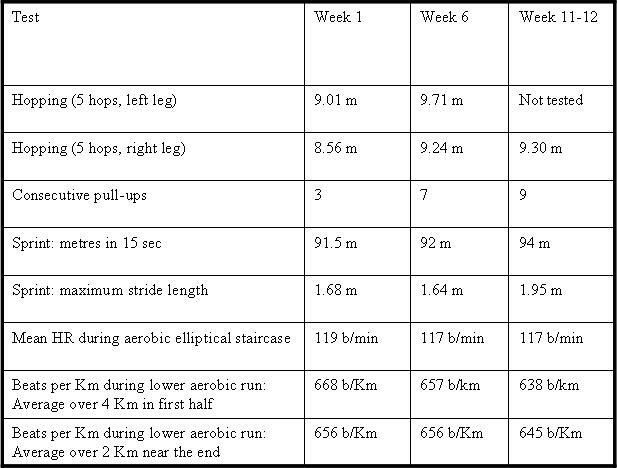 There was a substantial improvement in leg strength, mainly achieved in the first six weeks with only a marginal further increase in the second six weeks. During the second half of the block I made only small increase in intensity of training by adding a small amount of fairly low intensity plyometrics. Further improvement will require a substantial increase in the intensity – either increased resistance or increased intensity of plyometrics. There has been a major improvement in upper body strength though this is coincidental to my main goals. Nonetheless, I have almost achieved my minor goal of regaining the ability to do 10 consecutive pull-ups, as I could years ago. With regard to sprinting, I have extended the list of outcome measures to include maximum stride length Sprinting speed itself is not really my main objective. At baseline and at the mid-block test I had demonstrated a sprinting speed that might be regarded as reasonable for an aging marathon runner, but at that stage I could only achieve maximum speed by increasing cadence to greater than 230 steps per minute, which almost certainly reflects an inefficient balance between cadence and stride length. Therefore, in the second half of the block I made minor modifications of foot dynamics in an attempt to improve my stride length. I did succeed in lengthening my stride almost to 2 metres, at a cadence of 193 steps per min. On account of the reduced cadence, the increase in speed was only a marginal. Nonetheless, if I can get my cadence back up to 200 steps per min while maintaining a stride length around 2 metres, I will be very pleased. So in conclusion I think it is probable that I am now sprinting somewhat more efficiently, but I still need to increase my leg strength and power a little more to allow me to get my cadence back to 200 steps per minute. The one serious adverse development was the episode of arthritis. This was probably coincidental rather than being a consequence of the training, especially as the first signs were in the neck. It is perhaps possible that overall stress level played a role, but there is little evidence to support this hypothesis, especially as I was careful to moderate the intensity of the session whenever I experienced increasing tiredness or evidence of increased heart rate at a given work-load. The reduced frequency of episodes of arthritis in the past few years suggests that training actually diminishes the risk. So overall, it has been a successful first block, but assessment was somewhat confounded in the final week by the recurrence of arthritis. The arthritis has demonstrated that I will need to build some flexibility into my three year program, but it provides no reason to adjust my long term goal. In the next block, the primary target will be an increase in aerobic capacity and the major feature of the program will be an increase in the volume of aerobic running. However increasing leg strength will still be on the agenda. I will increase the intensity of the plyometrics and add some down hill running. This entry was posted on January 30, 2010 at 11:38 pm and is filed under Training. You can follow any responses to this entry through the RSS 2.0 feed. You can leave a response, or trackback from your own site. I’m glad the arthritis is responding to treatment, hope it continues. Do you take glucosamine? Hi Canute, I’m glad you are getting better. You’ve made some significant gains over the course of 12 weeks. The stride length when sprinting and beats/km are significant. Does your stride feel normal or ‘natural’ when sprinting, or are you having to concentrate on technique? Andrew, In general I am not enthusiastic to take medication or supplements unless there are good reasons to take them and furthermore the risks as well as the benefits have been fairly well mapped out. In the case of glucosamine, the deterioration of cartilage in my joints is probably a good enough reason to consider trying it. The evidence for a beneficial effect on cartilage it is moderately convincing and the risks appears to be small. So the evidence is almost strong enough to persuade me to try it. Ewen, I am afraid that my ‘experimental’ sprinting style requires conscious effort. Although sprinting fast is not my primary goal, I have experimented with adjustment to foot dynamics partly because I am interested to know how much more efficient it is to land with slight dorsiflexion of the foot. I currently land with a plantar flexed foot when running long distances. Hitherto I have regarded the beneficial effect on my joints of the softer landing more than compensates for the slight loss of efficiency. My recent sprinting experience makes me wonder if I should reduce the level of plantar flexion at footfall even when running long distances. I will persist with this style of spring for a bit longer before deciding whether the evidence of benefit justifies alteration of my foot dynamics when running longer distances. However I do not know whether the increased stride length was mainly due to the difference foot orientation or simply am effect of decreasing my cadence because I was thinking of something else. EARL FEE video, It’s amazing to see his stride compared to his fellow athletes of the same age. He says he stretches 3 x per day! In contrast the other guys have very painfully short choppy strides and poor posture. P.S. anyone read his book and what does he say about how to get good running form??? Rick, Thanks for the link to Fee’s amazing 800m race. He has a great range of motion with his swing leg. I have not read his book. I would be very interested to know if it is the stretching or the development of strength and power that has played the larger part in maintaining his range of motion. Overall, the evidence indicating major benefits from stretching in younger runners is not strong, but I am not aware of much evidence regarding older runners. In my own experience, I am aware of loss of both flexibility and strength with passing years. I am still inclined to think that working on strength and power is likely to be most productive, as this is likely to improve flexibility as well as strength, but I will look out for further evidence of the value of stretching for older runners. Thanks also for your recent comment providing the link to the material on barefoot running by Lieberman and colleagues. When I get time, I will post my currents thoughts on barefoot running. Rick, Thanks again. I am especially pleased to see Lieberman presenting foot dynamics that are essentially what I was describing in the debate with JonP a few weeks ago. I also note that at the relatively slow speeds illustrated, the barefoot runners show a minimal degree of plantar flexion on landing. This is not too different from your argument for slight dorsflexion, based on Coe. I suspect that at faster speeds, landing on the forefoot with a mild degree of dorsiflexion at footstrike might actually be most efficient but for long distance running, the ankle should be a little more relaxed at foot strike so that it is neutral or slightly plantar flexed. I think land with a relaxed foot, then allow the ankle to dorsiflex works well! I think the pose method of landing plantar flexed is incorrect and will only lead to injury. I’ve read that even top sprinters are now recommended to dorsiflex their ankles. if I can find the report from PEAK PERFORMANCE I will sens it to you.